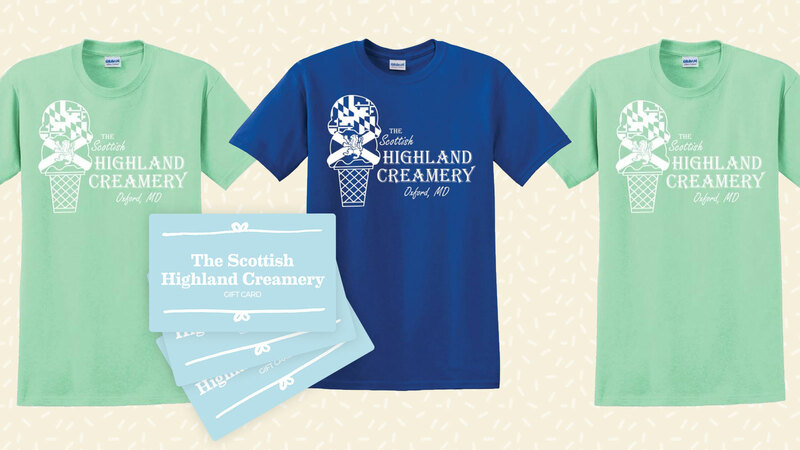 Lots of exciting, new things happening at Scottish Highland Creamery this season! First, we know you’ll love this year’s awesome new t-shirts! Available in both mint green and blue, they feature the Maryland and Scottish flags as a giant ice cream cone. Get yours today, and when you wear it back to the window, you’ll get FREE SPRINKLES! Totally worth it! Available now, for $15.00 each. Next up: Give the gift of good taste. We are now offering Gift Cards! We know a lot of you have been waiting for this one. Available in any dollar amount, and with no expiration, these cards can be purchased at the window, and make the perfect gift for friends, family, teachers and co-workers… I mean, who doesn’t love ice cream?! You may have also heard that we are stepping our technology up a notch as well, and we are now able to accept credit cards at our window. See you soon!